altezzaclub had the most liked content! Woo! Nice! I was expecting something rougher than that! So it can be a project car that is off the road being worked on while you do an engine upgrade. In 15years your first-born can drive it!! Would you like to start a new topic with this question, it would be easier to find in the future. Where do you live and what engines are around?? There is the 2L Toyota Y engine (114lb.ft) that would fit, at least is has a square bore and stroke, or the long stroke 7K (103lb.ft) as you said. An oversquare 18R would be another contender, (107lb.ft) in fact you could fit almost anything with a bit of work.. How big is your budget and how much experience do you have in swapping motors? Are you sure the 5K is in good condition? Do a compression test and check the points and timing to see how well it is performing. It is definitely a bit small for a commercial vehicle. Depends on how long you're going to keep the car... The old alty will wear out & a new bracket is not that hard a job. Its probably worth mailing a bracket from Aussie, although if you can easily return the alty & get your cash back you might as well. Where abouts are you?? Did you buy the car? Is it going to be your daily driver or do you drive something else? Stick up some photos..
Yeah, looks like there is a wire missing off the coil +ve. The ballast resistor drops 12V down to 9V for the 9V coil, but it gets bypassed when you're cranking. So the +ve coil side has two wires, one straight from the key for cranking, and one from the ballast resistor for running. Then the -ve goes to the dizzy, and to the tacho if you have one, and often to a capacitor to get rid of radio noise. Get a test light or a multimeter and find the wire that is +12v when the key is on cranking, it should be red, that goes on coil +ve. Check that the wire from the ballast to coil +ve is live when the key is just on ignition. Check where the coil -ve wires go to. You only need the one going to the distributor really. With the points open and the key on ignition, you should get a spark across the points with a screwdriver. There are wiring diagrams on here. See how you go... Oh, that purple wire just goes around the engine bay to the other side I think. [sigh].. I've had these rims lying around for years, in great condition but I'd never worried about moving to 14". Anyway, I bought a set of Toyo Nanoenergy 3 tyres last week, had them fitted, jacked the car up... and although the rims go on the hubs the wheelnut shanks won't go in the holes! So more measuring and I find they fit KE10s or KE20s, but not KE70s. $420 the lot, excellent condition rims and tyres that have not been on a car! or $200 for the rims and I'll use the tyres on other wheels. I can deliver to Lithgow, or out to Wellington, or anywhere up to Armidale. Otherwise I can freight, but unless these rims are rare I can't see that being economic. Start a new topic & give us some details... Have you put a multimeter between the starter body and the battery negative?? The resistance should be under 1ohm. I'd be onto that thanks Stu, I'll shoot you a PM. Well, I finally got down to the wrecker and took a look around for plug leads. The Nissan lead had been doing well, but I found a set on a Mazda Astina that fitted fine. Put this in your notebook, because the Takumi tax on these things is pretty steep!! Still trying to sort wheels, although I've bought the 14" tyres. 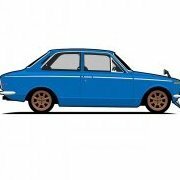 Just can't decide which set of alloys for the Datsun 1600 & which for the KE. Wheelnuts and washers for both sets are a pain, they're 17mm shanks while everything these days is 18.3mm. They're the same K motors so I'd be amazed if it didn't work. Manual and auto are the same, the wiring inside is the difference with the auto lockout, you will have all of that and it won't make a difference. How come it hasn't got a starter? or has it got one that doesn't work? None at the wreckers locally?? There are 3 or 4 here in Orange. Well, its so clean its worth putting some money into so you get a car you love and keep it for 20years.. I'm sure no-one would have thought KE70s would be worth keeping for 40years, but they are quite sought-after now. Save up more cash and do the 4AGE conversion, at least you can do that yourself. If the exhaust rusts out in the meantime put a larger one on with sports mufflers, and if you're really keen find a free-flow aircleaner setup, but anything more would be costly for not enough gain. I couldn't find any of the major cam grinders in Aussie advertising 4AF cam profiles, so that might be a sticking point for internal mods straight away. Well, straight off the diagram they should be- Black/Orange- well, B/R is +12V from engine fuse, maybe B/O is it. You don't have a B/R. Yellow, Yellow, Check & make sure one is not yellow/white, the charge light. Yellow/Black- oil pressure light Red/White- handbrake light Red- hazard relay (Europe) Yellow/Blue- fuel sender light Black- Tacho feed ------------------------------------------------- Green/Yellow- indicators right Yellow/Red- Fuel sender unit Green/Black- indicators left White/Black- Earth White/Black- Earth Yellow/Green- water temp Red/Blue- +12V in from gauges fuse White/Black- Earth --------------------------------------------- Blue/White- choke switch (Europe) Green- +12V for lights but "not headlights" ----------------------------------------------- Red/Green- Clock Pink/Blue- Cig lighter You should put a couple of extension wires on a multimeter and put one probe in these plugs, then see if it comes out where it is meant to under the bonnet or around the car. That's the only way to confirm it. De nada- Todos necesitamos ayudar con autos viejos.